An adult lecanium scale, approximate size in 1/8 inch diameter. San Jose scales infesting a cherry branch. During the winter, cherry leaves infested with scale insects do not drop from the tree. 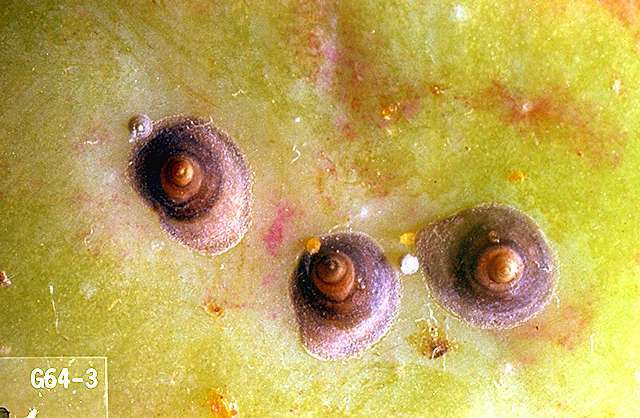 Three adult San Jose scales on the surface of an apple fruit. Each scale is about 1/16-inch in diameter. Note the minute yellow crawler stage of the San Jose scale is also present. Pest description and crop damage Adult lecanium scales are up to 0.2 inch across, reddish brown, and rounded. They resemble small helmets or bumps on branches, stems, and the underside of leaves. The crawlers are flat, oval, and pinkish brown. San Jose scale was introduced to the U.S. on flowering peach in the 1870s. It is now a pest of all fruit trees and many ornamental and wild trees and shrubs throughout the U.S., particularly in hot, dry climates. San Jose scale can be differentiated from other scale insects by the scale (shell) that covers the adult females. The scale is hard, gray to black, cone-shaped and has a tiny white knob in the center with a series of grooves or rings around it. Scale are closely related to aphids, mealybugs, and whiteflies. Like these insects, they also have piercing-sucking mouth parts. Large populations of scale can devitalize plants and retard growth. 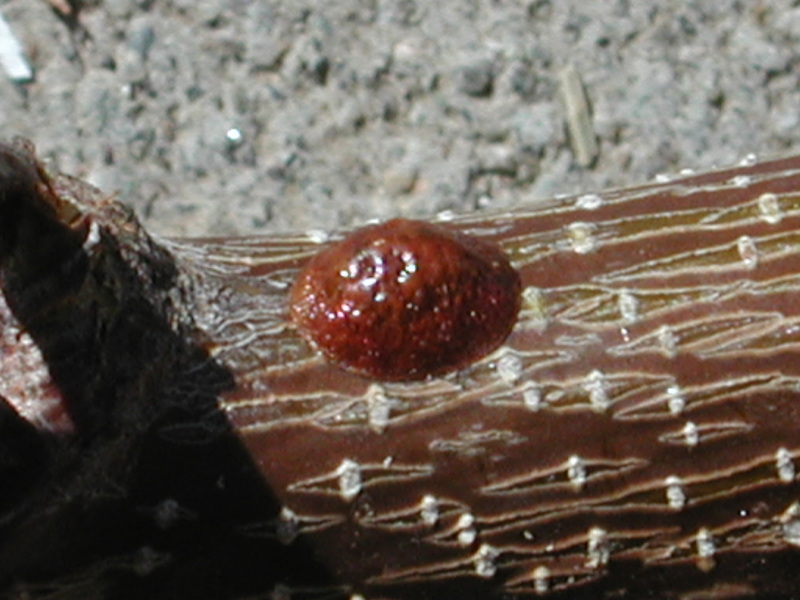 Infested trees show small, grayish to brownish disk-shape areas or spots and raised surfaces on the bark. Severe infestations can kill twigs. Large quantities of honeydew are produced which causes russeting on fruit and growth of sooty mold fungus. San Jose scale is the more serious pest of this group. It can kill trees and the secondary effect of sooty mold can result in discolored fruit. Lecanium scale can also be a serious pest. Biology and life history Lecanium scale overwinters in an immature state on twigs and branches. This scale resumes feeding in the spring, and eggs are laid underneath the female (from May to June) where they remain until they hatch in early summer. The young scales, called "crawlers," migrate to the undersides of leaves to feed. Crawlers can also be dispersed by wind, rain, irrigation, or by the movement of people and machinery. 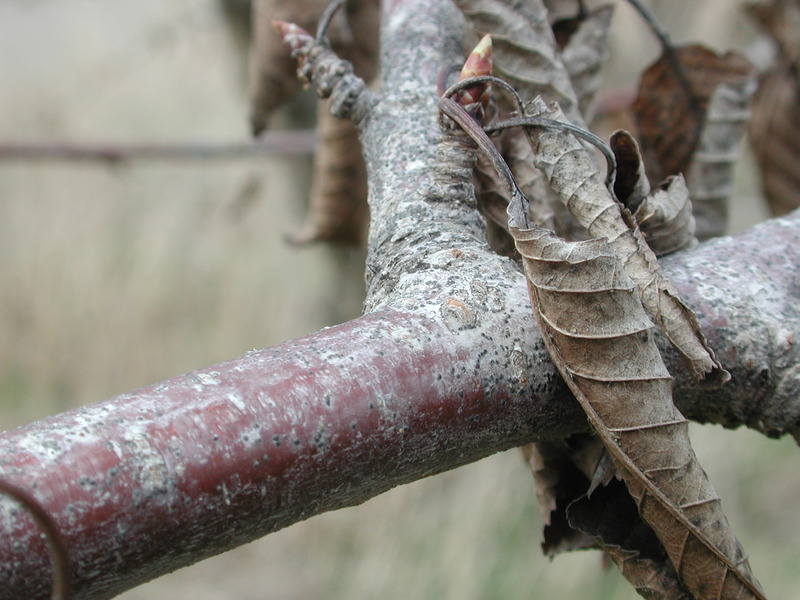 After 4 to 6 weeks on the leaves, the crawlers return to the stems and twigs to feed, mate, and overwinter. There is one generation per year. San Jose scale overwinters in an immature state and is black in color. In spring, the tiny winged males emerge and mate with wingless females. Females give birth to live young about a month later (no eggs are seen). The young scales, called "crawlers," are very small, flattened, and yellow, and move around on bark and foliage before settling down to feed. Young scales also can be dispersed by wind, rain, irrigation, or by the movement of people and machinery. A few days later, they secrete a waxy coating over their body that protects them from pesticides. From this point, female scales do not move. Crawlers are present during June and July and again in August to September, consisting of two generations per year. Pest monitoring In cherry orchards, leaves of infested trees do not drop in the fall, making detection straightforward. Inspect twigs during the dormant season for scales. Pay particular attention to weak plants. Observe the young bark for purplish-red halos which indicate infestation. The crawlers are best observed during June to July with a 10X magnifying glass. Crawlers can be monitored by wrapping a piece of black sticky tape around an infested branch with the sticky side out. Scale can be rubbed off plants by hand with a glove or toothbrush. Major infestations can be pruned off. Tanglefoot, "stickem," or a similar adhesive can be applied around infestations of adult scales to catch the crawler stage. As with aphids, avoid excessive nitrogen fertilizer, as this favors increases in the population. Control crawlers in mid-June or early July. buprofezin (Centaur 70 WDG) at 34.5 oz/a. REI 12 hr . methidathion (Supracide 2E) at 8 pints/a. May mix with a horticultural mineral oil (rates vary; see product label). REI 3 days. pyriproxyfen (Esteem 35WP) at 4 to 5 oz/a. May mix with a horticultural mineral oil (rates vary; refer to product label). REI 12 hr. Pyriproxyfen is a growth regulator with activity towards egg and immature stages only. Under heavy scale pressure, use the higher rate. Apply May to July. Control crawlers in mid-June or early July. buprofezin (Centaur WDG) at 34.5 oz/a. REI 12 hr. PHI 14 days. Do not make more than two in-season applications per year. diazinon (Diazinon 50W) at 4 lb/a. REI 4 days. PHI 21 days. Do not exceed one in season foliar application per year. Do not apply within 300 ft of aquatic habitat. imidacloprid (Provado 1.6F) at 4 to 8 fl oz/a. REI 12 hr. PHI 0 days. Do not use until pollination is complete and bees are no longer present. pyriproxyfen (Esteem 35WP) at 4 to 5 oz/a. REI 12 hr. PHI 14 days. spirotetramat (Ultor 1.25SC) at 10 to 14 oz. REI 1 day. PHI 7 days. Do not apply until after petal fall.